Sep. 12, 2017 4:00 p.m.
One woman and one man are facing charges under the federal Fisheries Act, after police were alerted to people breaking the claws off of live crabs and throwing them back into the water off the White Rock pier last week. Const. 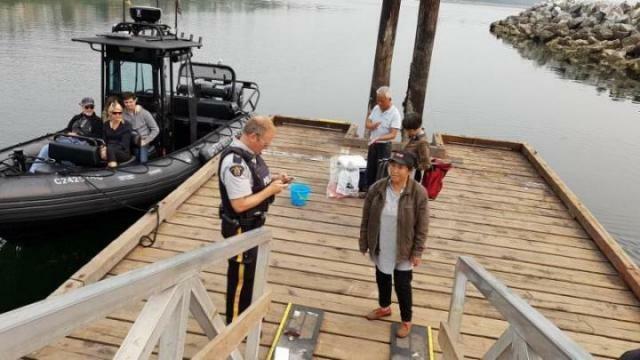 Chantal Sears confirmed Tuesday that charges – fishing without a tidal licence, catch and retain undersized red rock crab, and catch and retain Dungeness crab – were sworn that afternoon against a White Rock woman and a man from Belgium. Police were called around 1 p.m. Sept. 7 to the dock, for “people taking undersized crabs, ripping their legs off and throwing the bodies back into the water,” Sears said. “It’s the first time I’ve seen that,” Sears noted, of the specific behaviour. A video posted to Facebook by local resident Andrew Newman Sept. 7 shows an officer pulling what appear to be crab claws from the jacket pockets of a woman on the White Rock dock. “It’s an act of greed and cruelty,” he writes. Many viewers – as of this week, more than 300,000 had watched the 34-second clip – agreed. “This is disgusting behaviour… nothing short of torture,” writes Margaret Halley. Officials with Fisheries and Oceans Canada (DFO) told Peace Arch News Tuesday that the agency’s Conservation and Protection unit is looking into the matter. Potential penalties could include a $250 fine for “molest or injure”, as well as a $50 fine for possession of each shellfish that is not measurable, said DFO communications adviser Michelle Rainer. Charged are Li Chun and Hsin Chan.